The Himalayas. If there was ever a natural wonder worthy of the title "epic" it would certainly be these towering peaks. Home to some of the tallest points on our planet, these ragged peaks are best known for the near insurmountable challenges faced by adventurers from all around the world. Considering their elevation, it would seem that permanent life simply isn't possible on these mountains. However, this could not be further from the truth. Among sprawling shrubs and diminutive herbs towers one of the most peculiar plants known to the world. To make things more interesting, it is a relative of rhubarb, a denizen of gardens and pies throughout much more hospitable climates. 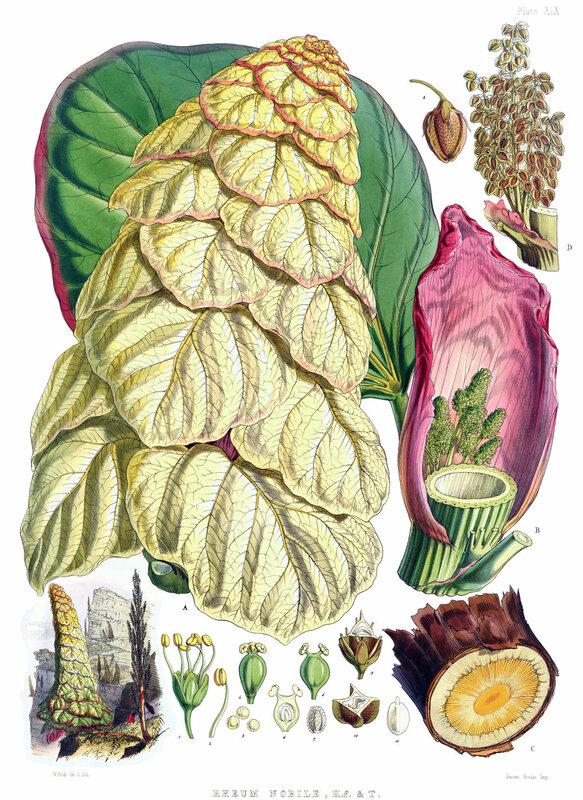 Meet the noble rhubarb, Rheum nobile. 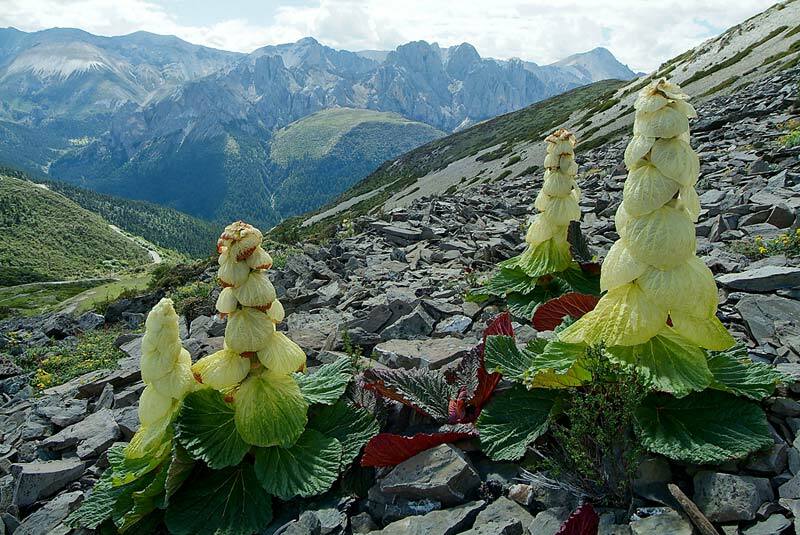 Growing at elevations between 13,000 and 15,000 feet (4000–4800 m), this species is quite deserving of its noble status. Plants growing at such elevations face some serious challenges. Temperatures regularly drop well below freezing and there is no shortage of damaging UV radiation. As with most alpine zones, a majority of plants cope with these conditions by growing prostrate over the ground and taking what little refuge they can find behind rocks. Not Rheum nobile. This member of the buckwheat family can grow to heights of 6 feet, making it easily the tallest plant around for miles. 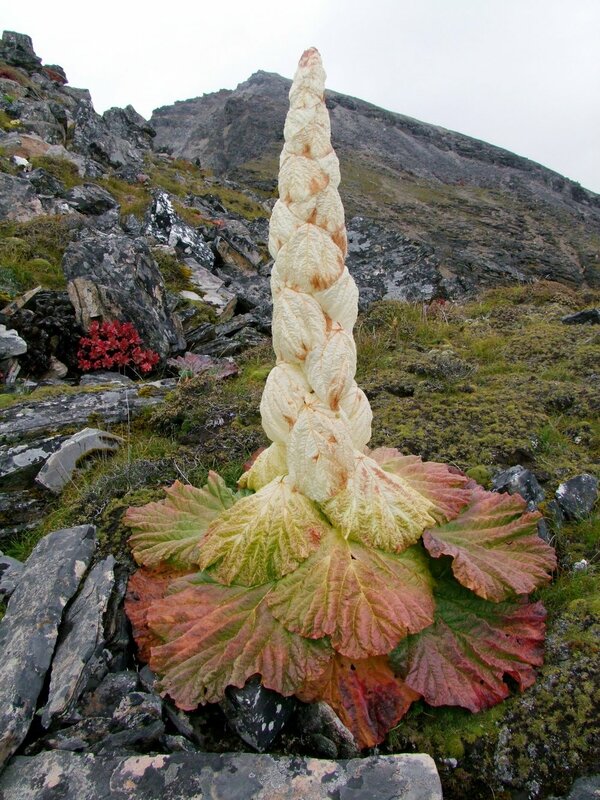 The most striking feature of this plant is the large spire of translucent bracts. These modified leaves contain no chlorophyll and thus do not serve as centers for photosynthesis. Instead, these structures are there to protect and warm the plant. Tucked behind the bracts are the flowers. If they were to be exposed to the elements, they would either freeze or be fried by UV radiation. Instead, these ghostly bracts contain specialized pigments that filter out damaging UV wavelengths while at the same time creating a favorable microclimate for the flowers and seeds to develop. In essence, the plant grows its own greenhouse. As a result, temperatures within the plant can be as much as 10 degrees warmer than the ambient temperatures outside. At such elevations, this is a real boost to its reproductive efforts. Even more of a challenge is the fact that at this elevation, pollinators are often in short supply. Plants have to do what they can to get their attention. Not only does Rheum nobile offer a visual cue that is in stark contrast to its bleak surroundings, it also goes about attracting pollinators chemically as well. Rheum nobile has struck up a mutualistic relationship with fungus gnats living at these altitudes. The plant produces a single chemical compound that attracts the female fungus gnats. The females lay their eggs in the developing seeds of the plant but, in return, pollinate far more flowers than they can parasitize. These organisms have managed to strike a balance in these mountains. In return for pollination, the fungus gnats have a warm place to raise their young that is sheltered from the damaging UV radiation outside.